Sudha Ragunathan sways London with her music. 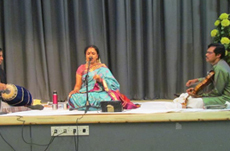 In concert at the Birmingham Venkateswara Temple, the Bharatiya Vidya Bhavan and the Kenneth Moore Theatre and workshops with children at Harrow and London, Sudha’s music traverses across generations. Running to full houses at all venues leaving the audience asking for more, this is another satisfactory step in carrying her music across the globe.